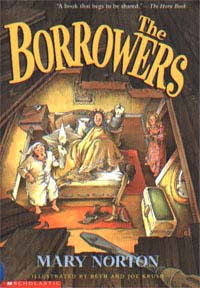 I always thought that Borrowers were fictional characters but now I am convinced that they are real. Infact , I am definite a few of them have taken up permanent residence in my house. How else can I explain the things that go missing? I never seem to find a stapler or scotch tape or an eraser when I need it. And pens! Borrowers seem to be inordinately fond of pens! Whenever I need to make a note I spent so much time searching for a pen that I end up forgetting what I was supposed to make a note of. Its not that they are just after stationary, they like to “Borrow” food as well. The other day I reached for a tea bag to make myself a cup of tea but couldn’t find any. The same thing happens with instant coffee sachets, cheese slices, cookies, chips etc. I am sure I stock up pretty well and I can’t finish all this food so fast now can I? And they simply Love chocolates. There is no other explanation for how the chocolates in my fridge finish so fast? I am sure I just ate 1 or 2, oh well may be 3 chocolates out of that big box but now the whole box is empty!! It’s GOT to be the work of borrowers! And how about needle and pins? Have you ever wondered where do all the pins and needles that we keep buying go? I wonder what they do with them. Use them as swords to fight? Another thing they love is socks. I am sure they use them as coverlets to keep warm at night. They seem to tire of socks pretty soon and leave them at the most unlikely places like under the bed or sofa or behind the wash basket before making off with a new one. They have an uncanny sense of timing and they filch a thing just when it’s needed the most, especially things like loose change or passport photographs. Sometimes they borrow things and return them by putting them in the weirdest of places. Many times I have found the TV remote wedged under the sofa cushions or my favorite silver earrings in a pen stand or my watch in the bathroom. I have lost count of the times when we are all ready to go out but I can’t find the car keys or the house keys. I run around trying to look for them while the rest of the family members stand about frowning and tapping their feet with impatience. I wonder why they frown at me, it’s not me who hides the keys in my jeans or simply plonks them behind that flower vase is it? You can’t really get rid of the borrowers. They just appear out of nowhere, decide they like it here and then simply make themselves at home. I have heard that there is just one sure-fire way to get rid of them. Just two words that they dread the most – Neat and Organized. But then I really don’t want to get rid of my borrowers. Infact I like them a wee bit. I am so used to sharing my house and things with them now. It would be so mean to become “organized” just to get rid of them. Hell, I hate that word even more than they do ! THE most entertaining post i've read in some time! LOVED it, absolutely LOVED it! @Swaram - yes, arent they! when I was younger, my grand dad would tell me stories about Bitanu miyaan. Bitanu miyaan was the size of your thumb but he was really smart and would help his 6 feet tall brothers out of trouble. :) Reminded me of a similar post i had written long back. They seem to be everywhere these borrowers! @ Raam Pyari -Thanks and welcome here !I have read a similar story when I was a kid - forgot if the hero was Bitanu Miyan or not ! @Preeti - yes they are everywhere! Which post was that ? wld like to read it. "Thanks for stopping by" ?? - didnt get this bit !! @Titaxy - off course not! One is never too old to read any book,even if it is childrens lit.